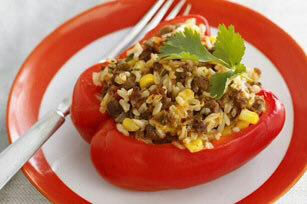 This Southwestern spin on stuffed peppers for two boasts a filling of meatless crumbles, corn, salsa, brown rice, cheese and (of course!) fresh cilantro. Cook crumbles, corn and salsa in large nonstick skillet on medium heat 5 min. or until heated through, stirring frequently. Remove from heat. Stir in rice, cheese and cilantro. Pour water into 8-inch square baking dish. Add pepper halves, cut sides up; fill with crumbles mixture. Cover. Bake 30 min. or until peppers are crisp-tender and filling is heated through. Top with fresh cilantro leaves before serving. For a change of pace, prepare using a green, yellow or orange bell pepper. This meatless dish has wholesome ingredients from several food groups. This recipe can easily be doubled or tripled. Just prepare as directed, using a large enough baking dish to fit all the pepper halves.